A Qatari engineer has come up with a device that could prove to be a boon to the arid regions of the world by producing water from humidity in the air. The advantages of “Agri Green”, which is described as a high-tech environment-friendly machine to improve water generation in the arid regions, in particular in the Middle East and North African region, were explained at a meeting convened by its developer Adnan Fahad Rashed al-Ramzani al-Naimi yesterday. While dedicating the invention to his mother and other members of his family, al-Naimi, also thanked the enormous efforts of his team members who spent more than nine uninterrupted months with him to make it a reality. “If our invention is properly and effectively used, it is certain to contribute to finding an effective solution to such critical issues as climate change and global food security,” the engineer said. Agri Green’s performance varies from place to place depending on the quantum of suspended humidity, he said. 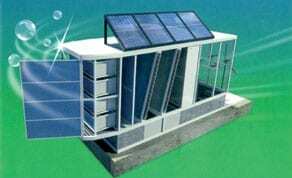 It could provide an average of 500 gallons of water a year in the local conditions, added the engineer. Al-Naimi explained that Agri Green does not use fossil fuel or electricity but provides itself with the required power for starting up, and operating completely from the free resources. He said what prompted him to undertake the task five years ago was the realisation that the world could suffer heavily in the absence of adequate water resources. “Water is the lifeline of all economic activities and it is undoubtedly the greatest necessity in life,” he said while reminding those gathered that the world today is faced with a host of issues such as water shortage, food insecurity, desertification, climate change and pollution of the limited water supply from sewage and chemical contaminants. Al-Naimi also said that the construction boom across the world is also contributing considerably to the shortage of fresh water. The impact of climate change on the quality and quantity of water resources in turn has resulted in drought-like situations in many parts of the world, in particular in the Middle East. “It is in these conditions that my team decided to embark upon the challenge of finding an effective answer to the issue of water shortage,” he said. Read more . . .
A cheaper more compact route to nuclear fusion? Discover More . . .
It’s the 21st Century. Where’s My Fusion Reactor?